I recently learned about the book Food Rules by Michael Pollan. Flipping through the book this week, rule 39 caught my eye. Rule # 39: Eat all of the junk food you want as long as you cook it yourself. The idea behind this rule is that the food industry has made it very easy to eat high fat, high sugar foods every day. The author gives the example of the french fry. If you had to buy, wash, slice and then fry the potatoes yourself, you probably wouldn't be eating french fries that often. They would be a treat only enjoyed occasionally when you had the time and energy to prepare them. I'm not drawn to package or store bought baked goods. Not a take and bake apple pie, not a slab of German chocolate cake, or a package of cookies. On the contrary, I love to visit small bakeries and, of course, to make things myself. I really enjoy potlucks because you get to try everyones favorite, and often homemade, entrees, sides and desserts. 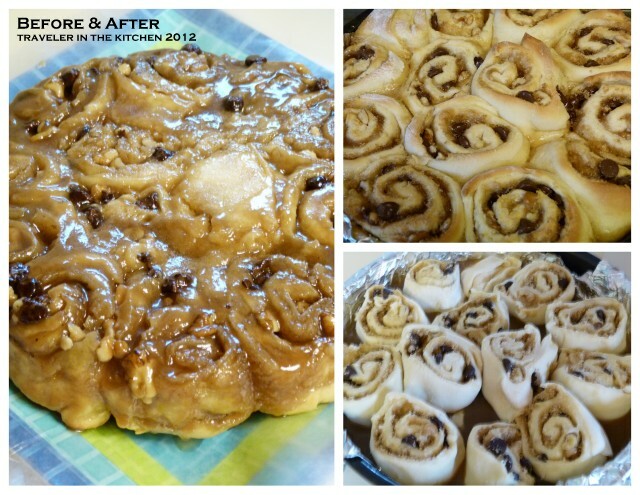 I don't eat sticky buns or cinnamon rolls very often. On a buffet, at a restaurant or in the bakery section of the grocery store, I will walk right past (I'd rather have bacon, thank you). Thinking Food Rules style, the food industry makes breakfast rolls easily accessible. I could buy them in a tube in the store for about $2 and 15 minutes later be diving into warm rolls. Rolls in a tube are ok. Better than a sharp stick in the eye, but nothing like homemade. 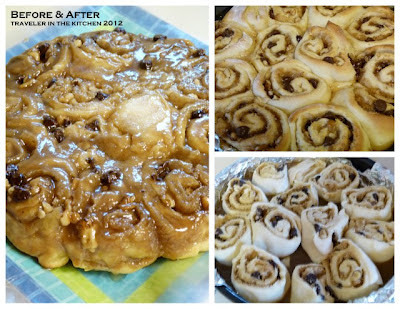 However, these homemade rolls took quite a bit of prep time and more expensive ingredients. These were perfectly suited to a cold and rainy Colorado day - but I don't usually have this kind of time. So I don't eat that many sticky buns. Rule #39 is one I can live with. Make these for a special occasion. Enjoy every bite. And eat some fruit for your other breakfasts this week. Confession: I'm not sure the last time that I made something that required yeast. Maybe in college in my food science and hospitality classes? I tend to lean towards cookies, bars and quick breads when I'm baking. I bought a three-pack of yeast, so I guess have I have two more chances to experiment. Let's grow some yeast, shall we? Heat 1/3 cup each of cream and water along with 2 tablespoons of brown sugar in a small sauce pan until it reaches 110-115 degrees (pull out your candy thermometer for this one - it doesn't take too long...if it's too hot, you'll kill the yeast, so if necessary, let it cool). Remove from heat. Add packet of yeast and let it sit for 10 minutes until it is foamy. Transfer yeasty liquid to a large bowl and add 1 cup of the flour. Using a mixer, beat on medium until smooth. Melt 2 tablespoons butter; add to bowl, along with 1 teaspoon salt and egg. Beat until combined. Beat in remaining 1 1/4 cup flour until combined. Transfer to a buttered bowl and cover with plastic. Let the dough sit in a warm place for until it doubles - about 1 hour. Line a 9-inch round cake pan with foil for easy cleanup, then butter the foil. In a small sauce pan, bring 3 tablespoons butter, 2/3 cup brown sugar, 1 tablespoon water and 1/2 teaspoon salt to a simmer over medium heat. Cook until the sugar is dissolved. Remove from heat. Whisk in the remaining 1/3 cup cream. Pour into pan. Combine 2/3 cup of brown sugar, 1/2 cup walnuts and 1/2 cup chocolate chips in a small bowl (cereal bowl is fine). On a floured surface (a large cutting board works great), roll out the dough into a 12 inch by 18 inch rectangle. Use the remaining 3 tablespoons of butter (warm in microwave if needed for easy spreading) and spread it over the dough, leaving an 1-inch edge around the outside. Sprinkle the buttered area with your sugar, nut and chocolate filling. Start (gently and slowly) rolling from the long edge to create one long log of deliciousness. The original recipe indicated that this recipe would make 9 rolls, but I managed to get 13 (the better to spread those calories out with more friends). Slicing Tip: Use a long piece of thread to slice your rolls. Just slide the thread under the log of dough and where both ends cross at the top, pull opposite directions and your pieces will slice nice and easy - much better than a knife. Place your rolls into the round pan with the "sticky" sauce. Line the rolls along the edge and put the remainder in the middle. It's ok for them to touch. Bake 30-35 minutes until golden brown. Let cool and then flip over onto a plate. Because you lined the pan with foil, this is really easy and doesn't leave you with pan coated with sticky sauce. Right out of the oven - these are amazing!